Days after formally announcing his presidential bid, an artist was showcasing his support for former El Paso Congressman Beto O'Rourke. 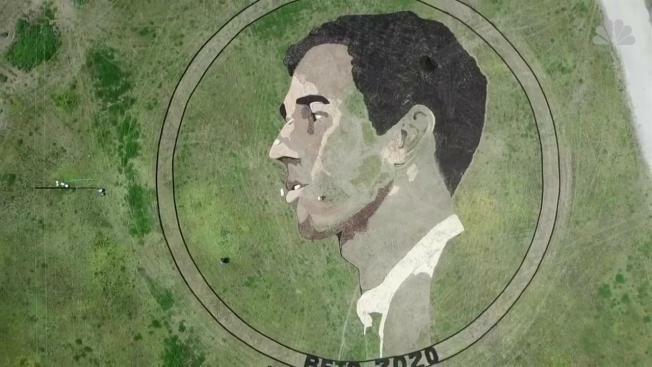 Kansas-based artist Stan Herd used soil, grass, and rock to create "Beto Earthwork", a two-acre piece of crop art in Austin depicting the candidate. According to Herd, the artwork will be visible to those flying into the Austin-Bergstrom International Airport. "He's doing this because he wants to express his support for Beto O'Rourke through an artistic medium," officials said. "He hopes will resonate with all who see it." Herd, who has been creating earthworks for more than four decades, also created a land portrait of Barack Obama in Dallas during the 2008 Democratic primary. Read more from KXAN here.